Backed by 36 years of plumbing experience we do it all, from repairing sinks, toilets, tubs and showers to jetting sewer lines and parking lot drains. We pump septic tanks and grease traps. We repair and replace lift stations. We clean roof stacks and offer video camera sewer line inspection. 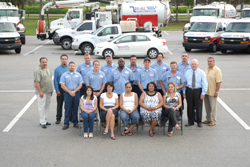 Du-All Sewer DrainÂ® & is a team of dedicated plumbing professionals who are committed to offering excellent customer service and high quality workmanship. In addition to Plumbing and Septic services, Du-All also offers Water Removal services for all your flood remediation needs. With trucks all across South Florida we are able to dispatch a team to your location in less than 1 hour, 24/7.